Leverkusen – German specialty chemicals company LANXESS has announced strong figures for the past fiscal year, with improvements in key reported numbers. “2012 was the best year in our growth story so far. Our business model proved itself once again,” said LANXESS’ Chairman of the Board of Management, Axel C. Heitmann, at the Annual Press Conference in Dusseldorf. LANXESS confirmed the preliminary results for 2012 that it published on March 7, 2013. 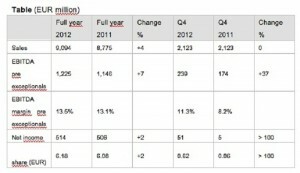 Group sales grew by 4 percent in fiscal 2012 to EUR 9,094 million. Business development was driven notably by the focus on emerging markets, solid demand for agrochemicals, pleasing contributions from acquisitions and the price-before-volume strategy. EBITDA pre exceptionals improved by 7 percent to EUR 1,225 million, compared with EUR 1,146 million in the previous year. The operating result thus came within the target corridor of a 5 to 10 percent increase. The EBITDA margin pre exceptionals amounted to 13.5 percent, compared with 13.1 percent in the previous year. Net income and earnings per share (EPS) improved by 2 percent in 2012, to EUR 514 million and EUR 6.18, respectively. The company will propose to the Annual Stockholders’ Meeting on May 23, 2013, that a dividend of EUR 1.00 per share be paid for 2012. This represents an increase of about 18 percent compared with the prior year and results in a payout of roughly EUR 83 million. The employees will also benefit from the strong earnings, receiving some EUR 115 million in profit-sharing payouts for the year. This figures compares to about EUR 100 million for 2011. The Asia-Pacific region again proved to be a stabilizing factor in 2012. Sales grew by about 10 percent to about EUR 2.2 billion. In Greater China (Hong Kong, China, Taiwan), the EUR 1 billion sales threshold was exceeded for the first time. Business in North America also gained strongly, with sales advancing by more than 10 percent to roughly EUR 1.6 billion. The EMEA region (Europe excluding Germany, Middle East, Africa) – with sales of EUR 2.5 billion – once again accounted for the largest share of LANXESS sales, although business in this region showed a slight decline of just under 1 percent. In Germany, sales rose slightly to approximately EUR 1.6 billion. In the BRICS countries (Brazil, Russia, India, China, South Africa), sales moved forward by 1 percent year-on-year to nearly EUR 2.2 billion. Performance Polymers showed a solid performance and remained the largest segment in business terms, raising sales by more than 2 percent from the strong level of the prior year to some EUR 5.2 billion. The Butyl Rubber, Performance Butadiene Rubbers and Technical Rubber Products business units, which all serve the automotive and tire industries, experienced a drop in volumes. However, sales were buoyed by the positive portfolio effects from the Keltan EPDM business acquired in 2011. EBITDA pre exceptionals of the segment climbed by 6.4 percent to EUR 817 million. Sales of the Advanced Intermediates segment grew by more than 8 percent in 2012, to roughly EUR 1.7 billion. The increase was mainly attributable to continuing high demand for agrochemicals. Both the Advanced Industrial Intermediates and the Saltigo business units benefited from this demand, Saltigo having aligned its activities even more toward agrochemicals. EBITDA pre exceptionals climbed by nearly 16 percent year-on-year to EUR 305 million. Sales of the Performance Chemicals segment improved by more than 3 percent in 2012 to approximately EUR 2.2 billion. Volumes fell in the Rubber Chemicals and Rhein Chemie business units, where customers in the automotive-related industries account for a substantial proportion of sales. Positive effects came from the acquisitions made by the Material Protection Products, Functional Chemicals and Rhein Chemie business units. EBITDA pre exceptionals of the segment was down by nearly 3 percent to EUR 281 million, primarily due to higher energy and manufacturing costs. In 2012, LANXESS had sales of approximately EUR 1.6 billion with products and technologies for “Green Mobility”, which accounted for some 17 percent of overall sales. The company expects to achieve sales of some EUR 2.7 billion in sales from “Green Mobility” by 2015. The good business development led to a strong operating cash flow, as well as a sound balance sheet. Capital expenditures grew to EUR 696 million, compared with EUR 679 million a year prior. Operating cash flow showed a positive development in 2012. Despite an increase in working capital, this key indicator improved from EUR 672 million to EUR 838 million. “Net financial liabilities declined by EUR 32 million year-on-year to EUR 1,483 million at the end of the year despite acquisitions and increased investment activity,” explained LANXESS Chief Financial Officer Bernhard Duettmann. The ratio of net financial liabilities to EBITDA pre exceptionals fell from 1.3 to 1.2. “This underlines our conservative financial policy, which is characterized by long-term financing and far-sighted steering of financial risks,” he added. The transfer of company headquarters to Cologne is proceeding on schedule. Some 1,000 employees will move into the LANXESS Tower on the banks of the Rhine, which provides about 36,000 square meters of office space. The new Group headquarters building will be inaugurated on September 3, 2013. Contrary to the usual seasonal trend, the low level of demand that was already apparent in the second half of 2012 has continued into the start of the year in most businesses. Against the backdrop of current weak demand in the tire and automotive industries in Europe, LANXESS expects a significantly lower year-on-year EBITDA pre exceptionals of between EUR 160 and 180 million in the first quarter of 2013. This estimate already reflects start-up costs of EUR 20 million for the new butyl plant in Singapore. In the previous year’s quarter, LANXESS achieved an EBITDA pre exceptionals of EUR 369 million, which was the company’s strongest quarter ever. Based on the weak business development in the first quarter, LANXESS currently expects that the EBITDA pre exceptionals in the business year 2013 will not reach the record level of the previous year. As usual, LANXESS will give a more precise outlook for the current full year, when it publishes its first-quarter report on May 8, 2013. In this persistently volatile environment, LANXESS will continue to focus on cost discipline and its proven flexible asset management and expects a pick-up in demand in the second half of the year, so that the full year 2013 can develop into another positive one. The company is sticking to its mid-term targets of EUR 1.4 billion and EUR 1.8 billion EBITDA pre exceptionals in 2014 and 2018 respectively. For the current year, LANXESS is again planning capital expenditures of some EUR 650 million to EUR 700 million. Research and development expenditures are expected to grow by about 10 percent in 2013 from EUR 192 million in the previous year. The megatrend of mobility remains intact. The company believes the agrochemical end markets will continue to develop positively, particularly in Asia. LANXESS also expects a moderate recovery in the construction industry, with growth occurring mainly in Asia and Latin America. Even assuming a slow pace of economic growth, the Group aims to strengthen its market positions, especially in the BRICS countries.